What Liquid uses to execute your orders. In an exchange, a number of orders is placed at any time. Orders that are not executed fully right away are sorted into an order book by price. ASK is the red side of the order book. How much you will spend buying one unit of the product. How much sellers are asking for by selling you one unit of the product. 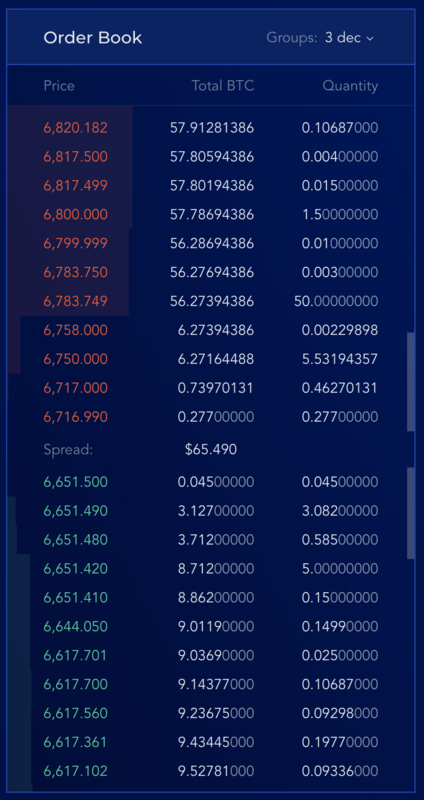 BID is the green side of the order book. How much you can get by selling one unit of the product. How much buyers are bidding to buy from you one unit of the product. As a rule, ASK is always higher than BID. Market buy orders will be filled using ASK price. Market sell orders will be filled using BID price. The spread is the difference between ASK and BID of a product at any time. The bigger the spread, the higher the volatility.